There are many reasons why you need a bike rack. Sometimes you may need to drive a long distance before you can get to ride, and sometimes it could be other reasons. No matter why you need it, there is the need to go for the best bike rack you can get. Before settling for a bike rack, there are things you will need to put into consideration such as how you want your bike carried; on top of the car or behind. If you need your bike atop, you will have to go for a roof rack instead of a hitch mount. You also need to put into consideration the type of bike you intend to carry. Most importantly, before picking a bike rack you will need to ask some questions as regards how secure it can carry your bike, the ease of assembly and installation, security, and overall convenience. The durability, price, the number of bikes it can take, tire size, and other things should as well be considered. Why it is important to consider a lot of things is because you do not want a piece that will not be able to carry your bike, or one that will not carry it securely. Also, you don’t want a rack that will allow unauthorized person take your bike away or one that will be hard for you to assemble and take off. The Thule T2Pro XT 2 is one of those bike racks that don’t get to come every day. To be honest, it is one of the most complete that you will get, as it is detailed, durable, easy to assemble and install, and at the same time, it is very functional. The hitch mounted tray rack is very friendly as it isn’t just easy to adjust, but the adjustability is also top notch. If you have fat tires, this will accommodate it as it has a wide tray adjustment range which will accommodate up to a 5” tire bike. More so, it is very easy to move it from the storage to the carrying position. With the bikes on, you can still tilt it away if you want to pick anything from the back of the car. Looking at the secure hold of the rack, this has very good ratcheting arm that fits 20-29″ wheels and up to 5″ tires. There is also the integrated cable lock. For security purpose, it features a 24″ cable lock that is very strong. Although it can only take 2 bikes, with the Thule T2 Pro XT Add-on which you buy separately, you can have as much as 4 bikes on the rack. It is very easy to attach. Not the cheapest out there. If you need a solid rack for carbon frames, mountain, downhill, or fat bikes specifically, this may just be your best bike rack. While it is expensive, it is completely worth the money. The NV 2.0 comes in after the very popular and powerful Kuat NV. The original came with great functionality but the newer model is even much better. It has a very good design and it is one that has been designed to last for a very long time. The rack has the ability to hold wheelbases of up to 48” and it can take 2 bikes that are up to 60 lbs. And it will take any type of bike including road and mountain bikes. One of the best things that you will come to see with this bike rack is that it offers a very secure bike loading. This is because of the burly cable locks that it comes with to ensure that you are able to have your bikes well secured on the rack. When you want to get this rack assembled, it may not be the easiest things you would attempt to do. The guide it comes with does very well in explaining the steps to take, but it may still be some labor, however, it works out much easier when two people install it. Finally, it is a very convenient one to use, as you can easily get to fold it when not in use, and as it comes with every tool that you will need for the setting up. It is a very durable rack. Not the easiest when it comes to loading a bike. This is one of the best bike racks you will get when you are looking to get a rack that is strong, secure, and quite versatile. Although the price is rather on the high side, it is worth every penny it asks for. Holds wheelbases up to 48" and tires as large as 4.8"
Made in the USA, the Saris Freedom SuperClamp 2-Bike is a compact and lightweight rack that has beauty and quality to it. The design is made intelligently to allow you to easily have your bike on and off. It comes without any frame contact that may damage any part of your bike. Instead, its ratcheting hooks hold the wheels of the bike firmly. Looking at the weight capacity, it is able to take two bikes of 35 pounds per bike. 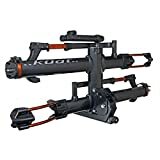 If you need something for your fat tire bike, this may serve, but that is only possible when you are able to get the Saris Fat Tire Wheel Holder separately on Amazon. Apart from the ease and secure fitting you get with the bike, it also comes with security for your bike. Thanks to the Rack-integrated locking cable. The cable is adjustable to ensure that it is well held. It is of high quality and it is made of non-rusting materials. It accommodates bikes of different sizes easily. Not one of the cheapest. The Saris Freedom SuperClamp 2-Bike is a very good piece that comes very unique, strong, and functional. While the price may be an issue for some people, it will serve as well as one needs it to. If you are on a budget, the Swagman XC Cross-Country 2-Bike rack may be the best bicycle rack for you. It comes as a very convenient and simple piece that still gives you ease of installation and secure fit. The rack is designed to accommodate 2 bikes that have 35 pounds maximum weight each, and a 1-1/4″ and 2″ hitch receiver. Also, it is able to fit from 20 inches to 29 inches tire sizes. While on one hand it is very well and intelligently designed, on the other it has decent build and quality. Admittedly, it is not the strongest on the list, but it still comes better than what one gets to pay, and better than many others in its class. Its main strength is in its functionality. From the assembly to the installation, everything is mostly breeze with it. What is even better is that it offers secure fit once properly placed and held tightly. It is very easy as well to adjust. Finally, if you need this for a fat tire bike, it comes with separate tire trays. Ease of loading and storing when not in use. Secure holding with an anti wobbling feature. Not the best in quality on the list but one of the cheapest. Although one of the main selling points for this rack is the value, it still has a lot of offer in the friendliness of use, secure fit, and overall good features. What is more that you can use it for various tires including the fat ones even though it would need separate trays. There are those that prefer to have a roof rack instead of a hitch mount. For such people, the Yakima HighRoad Upright may just be the best roof bike rack. It comes with a simple beauty that easily pleases and it is able to take 26″ to 29″ wheels on the hoops and tires of up to 3.25″. With many roof racks, the problem that many people have is the inconvenience they come with, most especially if you consider that they require that the front wheels of your bike be taken off. This is one place that this rack has an advantage than many others as you can have your bike with the wheels on. For loading on and off, it is very easy with this, just as it is also secure using a tool-free mount for the rack with a knob that tightens the hoops once they hold the wheels very well. This is very easy and convenient, thanks to the design which has a quick fix and release strap that is very strong. For security against people that may wish to steal your bike, it comes with a very strong integrated cable lock. The only thing though, is that Yakima decides to sell the SKS Lock Keys and Core separately so if you need one, you can as well order for it with the rack. You can also lock the carrier to the load bars easily. You don’t need to take off the front wheel. It gives secure loading and security. Accommodates different types of bikes. Easy to use and it has good quality. You need to buy the lock separately. The Yakima HighRoad Upright retuned as the best roof bike rack when the need is a roof rack that is strong, easy to use, convenient, and very valuable. When you decide to look, you will find that there are many racks that are quite cheap. The problem, however, is that many of those lack durability, ease of use, and in most cases, their features are limited. Which is why we put together these recommended best bike racks for cars and SUVs so that irrespective of the cost, you will find something that will last for you.